I´m rendering the beauty pass again with some modifications like, caustics enable for a more accurate color dispersion and wood texture for the two fosil boxes. I´m not using the physicalSky, I prefer more control and use a more classic ilumination mode with my own background color and intesty from the camera and some sopt lights and area lights for a better control in specular and photons. I think about the color bleed with the stainedglass in the afternoon was a good way to iluminate and create an athomsfere in the scene. Slow day at the office, decided to tackle this challenge. This is a very nice model, lots of fun to mess with. Done in Max 2009 and Vray. 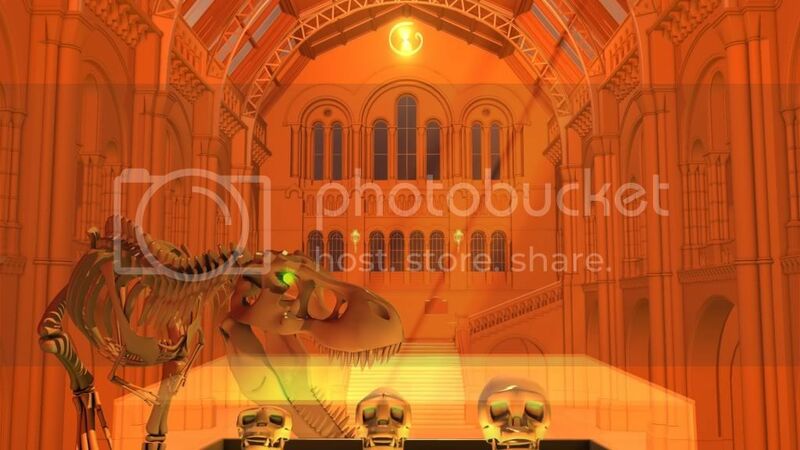 I tried to add more contrast, as well as get dramatic shadows from the dinos. A few materials have also been tweaked. All was done in Blender, except for the floor and building textures which are photos I prepared in Photoshop. I also used Photoshop for a few minor corrections. I really love critique and/or comments. In addition to those changes, there are a few reflections in the glass display now, I added an ambocc pass and I changed the direction of the moonlight. Thank you again for all your help and I look forward to additional critiques. Are there fabulous cash and prizes for winning? Cartman once said…you cant get anyone to do anything without fabulous prizes. Not that I agree, but Im curious? Your work look nice too. Maybe some textures and more depht in the camera angle could be better. I made a final render but hope some comments to take the final retouche, thanks Jeremy. Mmmmmm punch and pie… That makes this challenge even better! sorry that I am posting this this late - haven’t had any time to play 3d at home this week. The file is 3ds - I tried importing it in max and the dino objects seemed to come broken - you might have to weld some points on them. Also I rushed and never fixed the more angular lamp - that still has flipped faces and most likely 3ds broke the seams between flipped faces. Quick explanation of the file: Most pieces are instanced - I did this retarded manual copying off most of the pieces so that they would be instanced. This will be very helpful for any possible UV work and will definitely help in rendering memory usage too. File saving will also be zillion times faster with instanced bits. Cheers, looks like I might not have time to do the challenge right now but hopefully that is not the case. One for long shots and one for close-ups? I am limiting my use of tools to the freely available so I might be way off base here? New update. More work on the background illumination. Better rim lighting on the dino. Still doing tests for better texturing, and overall look of the image. I’m not using GI, only ambient occlusion and spot lights. Also a bit of post process for adjusting some specular layers and trying the dino to stand out a bit in the image. Dof, lens deformation and dispersion also in postprocess. I see very nice images in the thread… Good work everyone! . this one also has objects already split on layers. Same as the previous file - all instanced, objects linked to a null so I got the center line moved to origin and scaled to realistic scale (seemed that it has some typical inch/metric system scale issues). This file might act unpredictably in metric system units computers as the symmetry modifier doesn’t change its values when you choose to “scale scene to match system units”. You mean to tell me this is just a learning experience. God@#%$it…I want a hat or something! i’ve changed the whole lighting scheme. How do you like the view ? Hello, great renders here, congrats. This is my first post to this challenge. I have used Maya for lighting and Shake to comp the image. I tried to give it a dramatic look - something dramatic happening @ a place filled with magic. Not used any textures, as i was not sure dat i’ll be able to give justice to dat b4 deadline. So here it is…pls comment and guide.